Watching Virginia lately can be dangerous to your health. At least your mental health. After suffering their most devastating defeat ever in last year’s NCAA tournament first round, the Cavaliers traversed through a most perilous path to the national championship game. If you thought they had used up all magical powers against Purdue in the Elite Eight, well that was simply a precursor for what occurred Saturday night at a packed U.S Bank Stadium in Minneapolis. 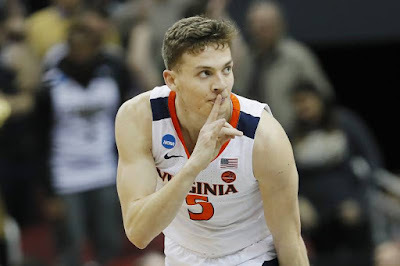 Kyle Guy’s six points in the final few seconds will be remembered forever as part of Virginia folklore. These guys are not just bouncing back, they are doing something by ripping out their competitors’ hearts along the way. Guy drew the foul on the baseline with 0.6 left in the game and earned three free throws to close it out. I watched as an inebriated Auburn fan spilled beer all over himself celebrating. It was like watching a coach get a premature Gatorade bath followed by the inevitable back breaker. In the social media world has been both troll and legend. He’s always engaging and never shied away from fan and media engagement. It seemed fitting for him to rise above all of the noise. There are some similarities in Virginia’s last couple of tournament wins. For one, as the final buzzers sounded, the opposing teams each celebrated a short-lived victory. By outlasting the Tigers 63-62, the Cavaliers will make their first-ever appearance in the national championship game. How else can describe it? After nailing a ridiculously difficult corner three-pointer, the junior guard had to like his chances to hit three in a row from the charity stripe? Well, sort of. It’s certainly happier times for this entire team. Almost half the locker room wasn’t even on the team that lost to UMBC. For the rest of the squad, they have certainly seen and experienced a lot over the last 12 months. From idiots last March making death threats, to the diabolical ingrates who swarmed the Charlottesville area last August. They have heard all the hate. Now they are feeling the love. On the verge of capping off an improbable run from being at the bottom last season to a possible title Monday night, Bennett had few, but impactful words to sum things up.